You don’t have to pay an arm and a leg in annual fees for a credit card that offers great travel rewards. There are many free travel rewards credit cards that offer rewards and perks you can use to fuel your wanderlust. We’ve uncovered the best free travel rewards credit cards. You’ll find credit cards with great signup bonuses, lucrative rewards and even promotional interest rates. 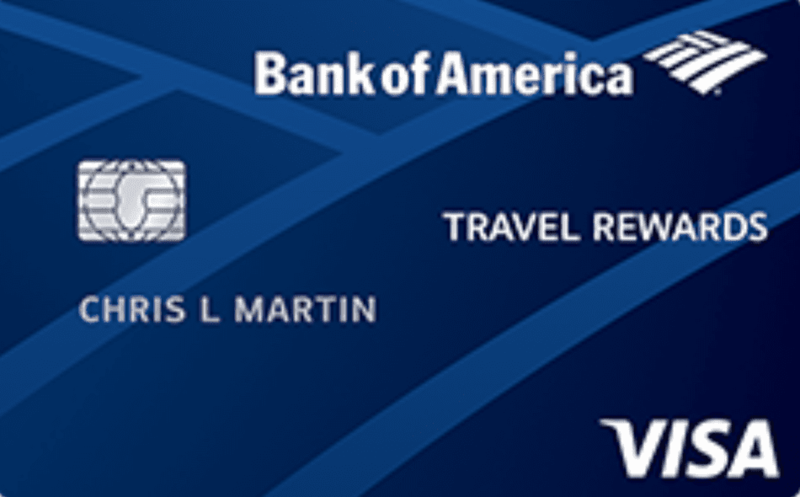 With the Bank of America Travel Rewards Credit Card, you’ll earn 1.5 points on every dollar spent. As a signup bonus, you have the opportunity to earn 25,000 online bonus points if you make $1,000 in purchases in the first 90 days of opening your account. The bonus is worth $200 statement credit toward travel purchases, including flights, hotels and rental cars. Plus, if you’re a Bank of America checking or savings account holder, you can receive an additional 10% bonus on your points. Important Pricing: Enjoy 0% introductory rate on purchases for 12 billing cycles. After that, the regular APR is 16.99% to 24.99%. There’s no annual fee and no foreign transaction fee. With the Capital One VentureOne credit card, you’ll earn an unlimited 1.25 miles per dollar on all purchases you make on your credit card. You can redeem your miles as a statement credit toward travel purchases you make on your credit card. There’s no limit to the number of rewards you can earn and your rewards don’t expire. As a new cardholder, you can earn 20,000 bonus miles when you spend $1,000 on purchases in the first three months of opening your account. Important Pricing: Enjoy a 0% introductory rate on purchases for 12 months. After that, the regular APR is 14.24% to 24.24%. There’s no annual fee and no foreign transaction fee. With the Discover it Miles, you’ll earn 1.5 miles for every dollar you spend on purchases. Rather than offering a signup bonus with a minimum spending threshold, Discover matches all the miles you’ve earned at the end of your first year. If you earn 500 miles, Discover will reward you with bonus miles. The bonus applies only to miles you earn in the first year. You can redeem every 100 miles for $1 statement credit toward travel purchases or cash back. You’ll enjoy one of the longest introductory promotional periods: zero% on purchases for 14 months. You could book your first trip and take a year to pay it off with no interest. There's no foreign transaction fee, which makes it great for traveling internationally. However, be aware that Discover may not be widely accepted in other countries. Important Pricing: The regular APR is 13.99% to 24.99%. There is no annual fee. Airline credit cards usually pay the highest rewards only on purchases you make with the airline. If you don’t fly often, but you eat in restaurants a lot, the card gives you another option for earning rewards at a higher rate. You’ll earn two SkyMiles for every dollar you spend on Delta and U.S. dining purchases and one SkyMile per dollar on other eligible purchases. Receive a 20% statement credit for Delta in-flight purchases. As a new cardholder, you’ll have the opportunity to earn 10,000 bonus miles if you spend $500 in the first three months. Important Pricing: The APR is 17.99% to 26.99%. There’s no annual fee. If you frequently travel on JetBlue Airlines, the JetBlue Card is a great choice for earning points that you can use toward flights. As a new cardholder, you’ll have the opportunity to earn 10,000 bonus points. To earn the bonus, you’ll just need to spend $1,000 in the first three months of having your credit card. Ongoing, you’ll earn three miles per dollar on JetBlue purchases, two miles per dollar on restaurants and grocery purchases. Plus get 50% in-flight savings on cocktails and food purchases when you use your JetBlue Card. You can redeem your points for any seat and at any time on JetBlue-operated flights. There are no blackout dates and your rewards never expire. Get a 0% introductory APR for the first 12 billing cycles following each balance transfer that posts to your account within 45 days of account opening. Important Pricing: The APR will be either 17.99%, 21.99% or 26.99%. There is no annual fee and no foreign transaction fee. With the PenFed Platinum Rewards Visa Signature, you’ll earn five points per dollar on gas purchases, three points per dollar on grocery purchases, and one point per dollar on everything else. Get a $100 statement credit when you spend $1,500 in the first 90 days. You can redeem the rewards you earn toward travel or other benefits. Get a 0% Promo APR on balance transfers for the first 12 months of opening your card - with a 3% balance transfer fee, subject to credit approval. You must be a PenFed member with a savings/share account to apply. You qualify for membership if you or a relative are a member of the armed forces. Important Pricing: The APR is 11.74% to 17.99%. There’s no annual fee and no foreign transaction fee. With the Blue Sky from American Express, get $200 back as a credit on your statement after spending $1000 in the first 90 days. You’ll have the option of carrying a balance each month or paying in full - paying in full is ideal to get the maximum benefit of the rewards you earn. The card comes with additional Amex travel benefits, like car rental loss and damage insurance, travel accident insurance, as well as roadside assistance. Important Pricing: The APR is 15.24% to 26.24% depending on your creditworthiness. The foreign transaction fee is 2.7% of each transaction after its converted to U.S. dollars.